A decent game, but a 0-0 draw in Andre Villas Boas’ first game in charge of Chelsea. Tony Pulis gave a a debut to Jonathan Woodgate at the back, and started with Stoke’s usual 4-4-1-1 from last season – two wingers, plus Jon Walters just off Kenwyne Jones. Villas Boas kept Didier Drogba and Nicolas Anelka on the bench, using two wide players either side of Fernando Torres. Chelsea struggled to get going and spent most of the first half dealing with Rory Delap’s long throws into the penalty area, but got better as the game went on. This was, as expected, a game with some strong challenges and lots of set-pieces. Stoke fielded four centre-backs and based their game around dead ball situations, though Chelsea generally dealt with them well – Petr Cech was keen to come out and try and punch the ball clear amongst the crowd. It was also very high tempo at the start. Jones and Walters closed down Chelsea’s centre-backs quickly which prevented John Terry and Alex playing the ball into the midfield zone – they had to go back to Petr Cech, who then thumped the ball downfield where Torres had little chance of winning aerial duels. Walters kept an eye on John Obi Mikel to try to stop him dictating play, though the Nigerian still had more touches than any other player in the first half. Villas Boas always instructed his Porto side to play high up the pitch and keep an aggressive defensive line, and that was immediately clear at the back today. Indeed, it was especially useful here because Chelsea wanted to keep Jones as far from goal as possible to negate his aerial threat, so Terry and Alex played high up. This is usually combined with pressing higher up the pitch, but it was impossible to assess how Chelsea will play under Villas Boas in this respect. Kicks from Asmir Begovic were always long, and the defenders looked to bypass midfield and hit Jones, so there was often no opportunity to press. The Chelsea midfield instead dropped off and kept it tight between the defensive and midfield lines – not that there was a particular threat from Stoke in that area. The different roles of wide players in Chelsea's 4-3-3. In light blue, the counter-attacking wingers under Jose Mourinho. They started from a position level with the midfielders, then sprinted forward to join the lone striker. In blue, the half-and-half wingers under Carlo Ancelotti - defending wide, but coming inside to link midfield and attack. In purple, the possible role under Villas Boas, staying high up the pitch and cutting into the box. The roles of the wide players will be one of the more interesting aspects of Chelsea’s play this season. They’ve almost always played 4-3-3 since the Jose Mourinho days, but he, Ancelotti and Villas Boas demand different things of their wingers. Mourinho wanted fairly classic wingers like Arjen Robben, Damien Duff and Shaun Wright-Phillips (Joe Cole being a slight exception) who would stretch the play, and drop off into midfield to form a 4-5-1 without the ball. Ancelotti, on the other hand, used players like Florent Malouda and Nicolas Anelka who would come inside to the midfield and make the side look more like a 4-3-2-1 with the ball – most obviously, in the title-winning 2-1 win at Manchester United. Judging by his time at Porto and his use of Malouda and Kalou here, Villas Boas wants something different. He wants wide forwards who can provide initial width, then come inside and provide a goal threat. In Portugal he used Hulk as a second striker to the right, and Silvestre Varela providing width on the left. Both stayed high up the pitch and sprinted towards the far post when the ball was on the opposite flank. It wasn’t entirely obvious what Kalou and Malouda were asked to do here – Kalou was quiet on the right, but Malouda played wider than he generally did under Ancelotti, although a couple of times his delivery was very poor when he received a pass. Meanwhile, Pulis switched Stoke’s wingers to provide different angles for crosses, but they weren’t at all threatening in open play, forced too far from the opposition goal. What they really needed was pace, and Walters was unable to provide runs in behind Jones, whilst also asked to drop off onto Mikel. Chelsea grew in stature in the second half, partly because Stoke pressured less from the front. The passing of Terry and Mikel was more incisive, and a couple of decent moments from Torres looked dangerous. 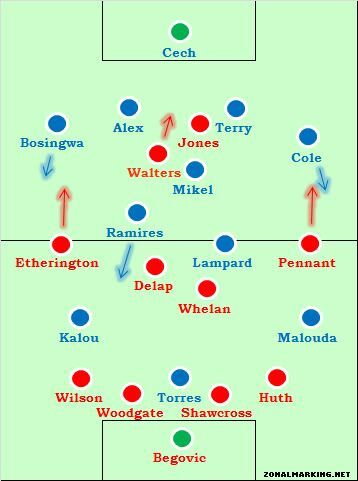 Their combination play was decent, but only really when Lampard and Ramires made forward runs – the wide players exerted little influence on the game and were both removed. When those two midfielders did get forward, it was notable that Chelsea’s players overlapped a lot, to drag defenders away from goal and allow the man on the ball inside. The closest Chelsea came to scoring was one of these instances, when Anelka curled the ball onto the bar. 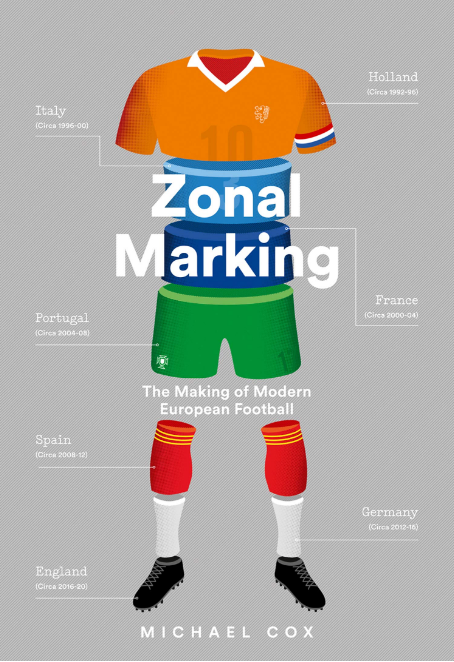 Villas Boas’ strategy late on seemed confused – Anelka and Drogba replaced Malouda and Kalou, and Chelsea then looked like a narrow 4-3-1-2ish shape, with Anelka behind the other two forwards, similar to how Ancelotti experimented immediately after Torres’ arrival. The man who many think would be best for that role, Benayoun, only got a couple of minutes on the pitch – and that was at the expense of Torres, rather than to combine with him. Some promising signs for Chelsea, but not yet a clear departure from the way they played last season. 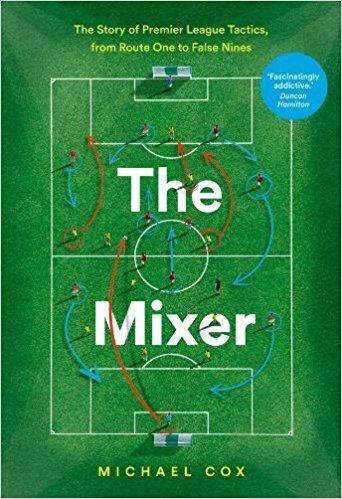 With practically the same squad and with Villas Boas favouring the same base formation, any’ changes will be slightly more subtle – the way they use the ball in deep positions, and the way they try and regain possession. This a difficult first outing – not only did Chelsea not look 100% fit (a theme of the opening weekend of the Premier League) they were also against tough, physical opponents. In no other game this season will the ball spend less time on the ground, and as Villas Boas wants a positive, attacking style of football, this might not be typical of Chelsea’s performances this season. For Stoke, it was more of the same – almost no difference in style from last season, and they should be comfortably midtable in 2011/12. I thought Daniel Sturridge should be given a chance to shine with his quick pace against big Stoke defenders, but he was not even on the bench. Sturridge is suspended for a few games I think. Chelsea probably could have done with Sturridge here, but he’s not available due to being sent off at the end of last season for Bolton. Still, he does look like his presence may be exactly what Chelsea need, if he’s played right. He’s serving a suspension carried over from last season. Great analysis. The thing that stood out for me as the difference between the first and second half was that the Chelsea midfield in general was more advanced, and it seemed Mikel was more open in the second half, while Ramires and Lampard made good runs on the sides of Torres, creating some promising situations. I agree on your comment that the late tactics seemed confused. I thought they would have been better off subbing Benayoun for Malouda/Kalou first and then perhaps bring Drogba instead of Torres towards the end. Also, Ramires seemed the key for Chelsea with his energy in many instances. Defensively as well as offensively, as he was strongest both in the pressing and the attacking movement. Credit to Torres, too. Played brilliantly, but wasn’t supplied properly and often had to do too much by him self. Lampard was disappointing for me, didnt get forward enough for me, espicially as there wasnt much threat from stokes midfielders and he had mikel behind him. He should have tried to link with torres more and play further up the pitch. The wide midfielders dont seem suited to there role today, maybe malouda would have done better on the right and kalou on the left, if they were supposed to be cutting in on goal. And and the fullback could have pushed further up, and let the side men cut in more, could have helped the team better. I do think the rest of the team played well and was quite impressed with torres, espicially as didnt have much help from midfield. Stoke were standard stoke, and do as well as they can with what they have, do they need to replace walters, not premier league standard for me. Totally agree about Lampard. Those late runs into the box which have become a tradmark of his game seem to be fast disappearing. Blame it on age, tactics, whatever, but Lamps isn’t going to reach twenty goals this season. Speed is the first thing that goes in all athletes. Lampard needs to realize his acceleration is gone and adjust. Either he needs to read the play sooner or he needs to evolve his game. Either way, something needs to change. Even in his prime Lampard was never the fastest, he scores so many because he reads the play better than most. Maybe he doesn’t have the stamina to constantly run up and down the pitch anymore? thats why I think in games like these when chelsea are the better team, he should be played further up the pitch, so he doesnt have to run as much, then he could link with the striker and become the link man between attack and midfield. I don’t even think he is that fit, letting McEachran do all of the running about he just gets caught watching a alot. I think Chelsea needs a right winger. A right back more badly. I disagree; Bosingwa played well on defence, and while his crosses were few (and poor), he joined the attack nicely, cut inside well (and didn’t fall too far out of position without the ball) and combined with Ramires. He’s not the first choice at right back, but it was a solid performance. If Chelsea add a winger, or Anelka/Kalou commit to being one, then either Ivanovic or Bosingwa are fine choices. Bosingwa and Ivanovic will always have room to run because of the threat’s Chelsea presents elsewhere. Somewhere there needs to be a whole in the defensive coverage. Sadly, neither Ivanovic or Bosingwa can take advantage of the acres of space they have to run. Their crosses miss and miss badly. Defenses know this and go unpunished for leaving these guys alone. Honestly, when Chelsea goes against a team that isn’t a real offensive threat from the left wing (not Stoke) I would be interested in seeing a winger or MF drop back here. Benayoun can cross and he’ll honestly have more space to attack from this spot then he would next to Lampard. It seems crazy but the best attacking fullbacks are all converted wingers. Or we could just buy Inkoom. That’d also work. Also, Chelsea doesn’t need a right winger. We have only one left footed attaching player, Malouda. Sturridge will fill in fine as a right footed winger, no matter if he plays on the left or right. But Chelsea badly needs an attacker that is comfortable with his left foot. Honestly, if Chelsea is looking for a quick cheap fix they should just look down the street for former Chelsea player Duff. He’d cost next to nothing and provide the left footed speedster they’d need. Luiz is confident on the ball and can play defensive midfield, and can cover on the right when necessary. Ramires can shuttle up the right and provide short interplay with the attackers. Wait a minute, isn’t Sturridge left-footed? I still think Chelsea are struggling to transition away from the 4-3-3/4-5-1 they played successfully under Mourinho with Drogba effectively occupying both centrebacks. Drogba’s showing his age now and there isn’t another player like him playing (at least I can’t think of any). Torres is too lightweight to play up front in a 4-5-1 Ancellotti tried to move Chelsea towards a 4-3-1-2/4-3-2-1 style but it didn’t always work particularly when key plays were missing or if the opposition played narrow. It’ll be interesting to see how AVB sets his team up going forward I think we will see more 4-3-3 as that fits most of Chelsea’s players better except Torres. They don’t really have the right type of midfielders to play 4-3-2-1/4-3-1-2 or 4-2-3-1 for instance as they lack creativity. Bringing in someone like modric may give them a bit more flexibility so I guess we will have to wait and see. 4-2-3-1 worked for him under benitez. Im sure he can play up front by himself with the right support. It was a decent performance from Chelsea, but they were really predictable going forward. Stoke happily sat deep and kept it extremely narrow. I know it’s difficult for AVB to bench a club legend like Lampard, but this really isn’t the system for him. Benayoun would be a better option alongside Ramires, or maybe even the young McEachran. The RB position is problematic as well, since Ivanovic provides little going forward and Bosingwa has absolutely no idea what to do with the ball. Interesting to see how their next match goes, and whether AVB makes any changes to the line-up. this isnt the system for lampard? so the system hes been playing 90% of the time since 2004 and which he had his best years in doesnt suit him? They lack creativity. The problems started under Mourinho who seemed to prefer “box-to-box” midfielders over creative ones. It is alright having one – Lampard is as good as any – but more than one leads to a one-dimensional midfield. No wonder they tried to buy Modric. And lets face it, Mikel is no Makelele. It is unclear what he is actually good at. Malouda and Anelka did OK in the wide positions a year or so ago, but they are getting on a bit. Malouda isn’t no Robben, and Kalou is simply shite. I found it very surprising when they bought Torres for 50m. They desperately need creativity and width. Agree almost completely with this, however I do believe Mikel is going to surprise some people this year. If I’m honest about the only player I really rate at Chelsea anymore is Ramires. The rest are either past it or quickly getting there, too lightweight or limited. AVB has a big job to do. Of all positions, Chelsea really need to get a world class right back. Just dunno what Bosingwa does there. They really need a Maicon or an Alves, not sure if they will be able to get any before the window closes. Thats the weakest link. Another position they need to fill is that of a creative midfielder. You cant challenge in Europe without quality service from the midfield. AVB is around such a long time now, still not sure why is he still delaying new signings. With more playing time, i think they will jell together as they improved consistently as the match progressed. On the bright side for Chelsea and AVB, Torres looks fit and was the best player on the pitch by a mile. Well it’s not saying match when you consider what Stoke puts out there. He looked sharp, though. He won’t be as successful as he was with Liverpool simply because the Chelsea midfield is trash. No body capable of spraying balls into the channels or behind the defense like he had at Liverpool in Alonso or Gerrard (his hollywood balls fail 9 out of 10 times, but when he does get it right, it’s glorious). Only assist’s Lampard provides is off deflections. Mikel can’t pass the ball more than 5 yards and how Kalou has managed to be a Chelsea player all these years is beyond me? Yeah, that’s a good point. Last year, in the EPL, Chelsea’s midfielders combined for a grand total of 7 assists: Essien, Lampard, and Zhirkov each had 2, and Mikel had 1. (Of course, both of Lampard’s assists were on set pieces – he did not have a single assist in open play). Drogba actually had 14 assists by himself… even West Ham’s midfielders contributed more assists than Chelsea’s (Hitzlsperger had 4 by himself and he missed half of the season). Before Essien got injured, I was contemplating Chelsea playing a 4-2-1-3, with Mikel and Essien as the double-pivot of the midfield. But with Essien hurt, and Lampard’s pedestrian play, I think Lampard might make way for Benayoun (or hopefully Modric) to provide service to the attack. The long-tenured midfield bomber isn’t necessary with such a top-heavy side. A final note: I thought Ramires was fantastic today. Aside from Torres, he was the liveliest player on the pitch. With that performance, I can’t see dropping him for Benayoun or McEachran. He’s the width of a toothpick, but he could be the next Essien. Then why not a double pivot consisting of Mikel and Ramires? It’s a good idea; but really would only work if Chelsea commit to a creative midfielder role to service the attack. Also, Ramires would need extra training on ball-winning–he got stuck in a lot this match (and last season) and hasn’t been getting the benefit of the doubt from the officials. If he grows in that regard, I could see it happening. Plus, any runs from deep would be a welcome surprise. awful idea. ramires’ ball retention is awful, and mikel makes too many mistakes and also lack creativity. Obi was fantastic today I reckon, there’s a real art to making yourself constantly available to receive the ball like he does, makes life a lot easier for his fellow team-mates. He’s one of few genuine holding midfielders in the Premier League these days, in the sense that he does “the Makelele role,” not as part of a double-pivot like Lucas or Song for example. Means there’s always a good passing angle if you need to recycle possession, he can sit deeper but always be facing forward and surveying the field of play. Can’t help but feel that if Chelsea had bought an Aguero or Suarez type (someone to play as that winger/forward) to give that pace and flair in the final-third they’d be my favourites for the title. mikel fantastic today? he didnt even have to work to receive the ball as stoke left him free and didnt bother closing him and even not under any pressure made some sloppy passes which could have been costly, one comes to mind where he made a disastrous pass in the chelsea box straight to a stoke player. I think Chelsea was really, really missing Luiz in the back. He provides the height Alex does (canceling out Jones’ ariel threat) but he is the most comfortable CB dribbling with the ball that I’ve ever seen. Luiz would have been able to help Terry dribble around the dual pressing forwards. Also, if there was a game to start Drogba with Torres it was this game. Drogba is as strong and as tall as Woodgate and Shawcross canceling out their skill but he is also much more agile. Kalou has always been good at using his speed to split through defensive openings but Stoke play too narrow and bunched for his speed to be an advantage. Drogba at ST cancels out Woodgate and Shawcross and Torres is way too much of an offensive threat for Wilson to deal with him alone. Amazingly, in the 20 greatest sides articles you quote Mourinho talking about the advantages of the 4-3-3 against the 4-4-2. Too bad Chelsea didn’t actually use any of their advantages that was laid out 5-6 years ago by Mourinho. I must say I am disappointed by AVB’s lack of changes today. Missing Sturridge and Romeu didn’t help but moving Ramires into Mikel’s spot and letting Benayoun start, giving Chelsea three MFs who can defend and create, and expanding on the 4-3-3’s natural advantage over the 4-2-2. Disappointing start. I really hope Chelsea adds a MF, a RB and a winger. Inkoom would be a nice start. Villas Boas is going to have a serious problem getting some creativity from that midfield if it so happens that Modric stays at Spurs.. I thought there was quite a lot of promise in Chelsea’s performance. Disappointing not to get a winner but that was down to a combination of great goalkeeping, poor finishing (Kalou) and denied penalities, not a lack of creating chances. Tactically you could see the difference from last season. Much quicker moving the ball, much more willing to run at defenders. Huge improvement from Torres. Sturridge will start on the right I’m sure, still think we need a dribbler who can play from the left (I guess Hazard or Mata are the best options left), and a good right back, but feeling quite positive all round. disagree, chelsea struggled to create hardly any clear cut chances. yes they hit the woodwork from out of nothing e.g. anelkas shot, no where near a clear cut chance. Your stats definitely prove chelsea came close but doesnt give any evidence that chelsea created many clear cut chances, the kalou header probably was a chance i agree, but maybe the only one…and against stoke chelsea should be creating several clear cut chances and scoring plenty of goals. I don’t think that this a good match to draw previews. It’s like an Alien vs Predator outing. I really like the new style of analysis. Very interesting discussion of the different use of wingers. Goes to show that the nominal formation is less important than the actual tasks the players have. Can’t wait for your analysis for the Clasico..
People are being a bit hard on us I feel, we’re basically a Zhirkov worse off than last season. Haven’t really brought in anyone at all. André Villas-Boas seems like the kind of manager who likes to adapt his system to what’s already there at the club, and I’m not sure how much this style of wingplay was AVB’s idea, or him simply using what was already there, since that movement was already a standard part of how Porto played under Jesualdo Ferreira. jesualdo´s porto is completely different from AVB´s porto…porto has a much more possession based game than before..
Great to see your reports back ZM!